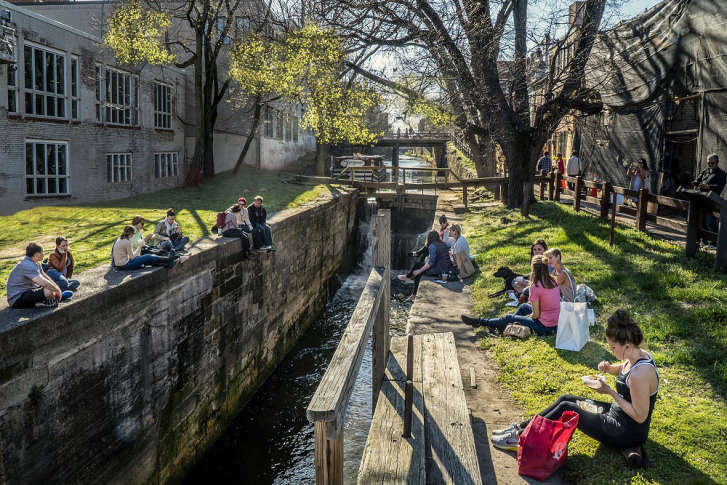 The historic C & O Canal in Georgetown is undergoing a makeover, and the firm behind Manhattan's High Line Park has been added to the design team. WASHINGTON — The landscape architecture firm that designed Manhattan’s High Line Park will join a design team coming up with plans to re-imagine Georgetown’s historic C&O Canal. Georgetown Heritage announced Wednesday the addition of James Comer Field Operations to the design team. The High Line Park in New York opened in 2009 on a nearly 1.5 mile stretch of unused elevated rail tracks. The design team already includes Make DC, Robert Silman Associates, ETM Associations and Dharam Consulting. The group is working on the Georgetown Canal Plan. Over the next year, Georgetown Heritage and the National Park Service will seek public input on ways to improve the canal’s stone structures, locks, towpath, plazas and street crossings. “This is an extraordinary opportunity for Washington, D.C., and the Georgetown community to create a transformative public space that blends historic architecture with rich landscapes to create a world-class and unique destination in the heart of the neighborhood,” said James Corner, founder and director of James Corner Field Operations. Georgetown Heritage says the project’s purpose is to re-envision the Georgetown section of the canal to maximize its education, recreational and aesthetic potential. The canal plan, repairs to Locks 3 and 4, and the launching of a new historic replica canal boat are the first phase of the C & O Canal National Historic Park’s multiyear restoration plan. The first phase began last fall and will be completed by summer 2018.